Another red and green outfit, I told you I love this colour combination. 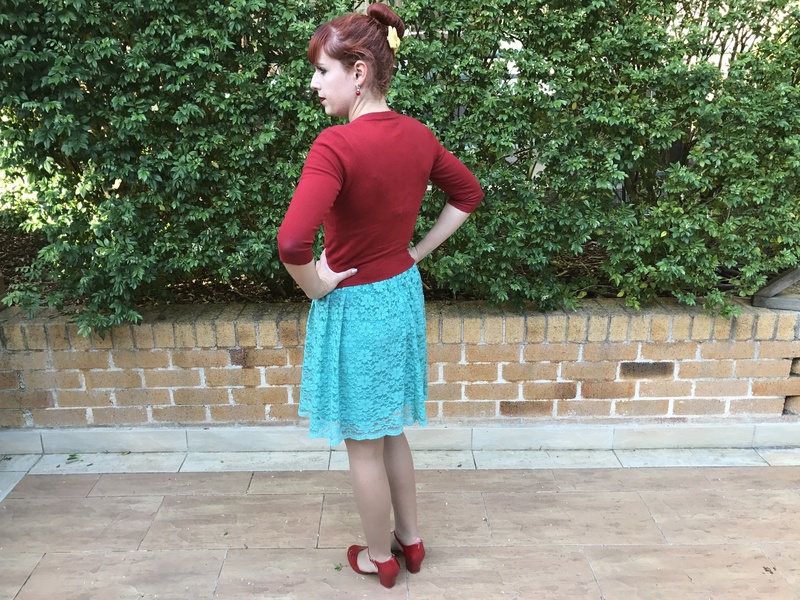 This outfit is the reverse of the one I posted earlier in the week- red on green instead of green on red. I like the way this outfit turned out. It wasn’t planned, it came together in a rush before work. I also like how this outfit combines a couple of old favourites. I’ve had the cardigan for probably five years now and there wouldn’t be many pieces in my wardrobe I’m still wearing from that long ago. (Back in the days I when had short brown hair). I like the frill detail and the silver buttons. It’s such a nice deep shade of red too. Red is actually incredibly versatile to me. 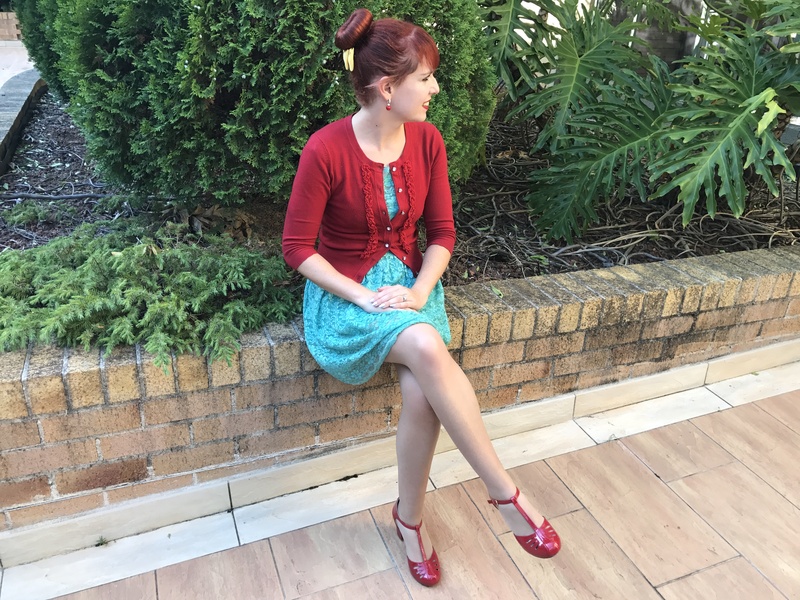 I could accessorise pretty much any dress in my wardrobe with red details.I did a remix post on this cardigan a few years ago here. 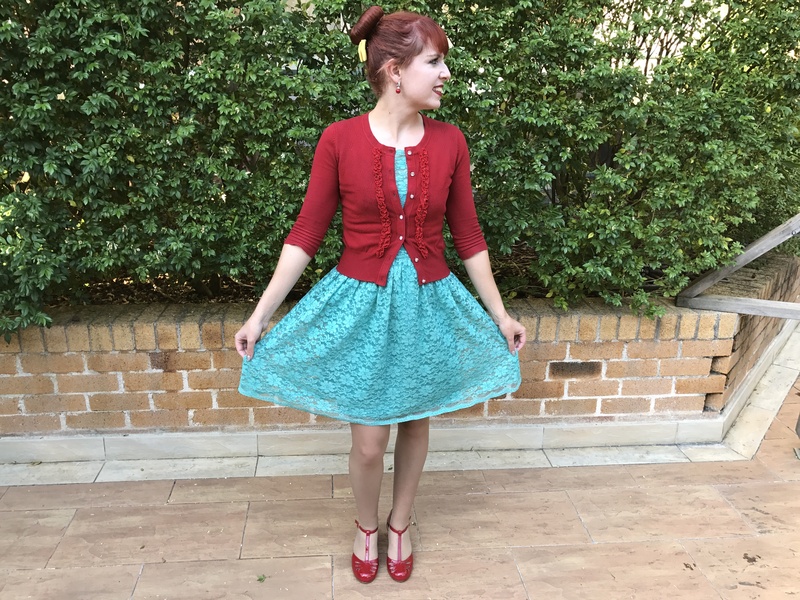 The mint green lace dress is another old favourite. I’ve had it for a similar length of time. It’s from Portmans and I was so surprised to find it in that store. It seems different to the usual Portmans style and I rarely go into the store. However, I’ve had so much wear from this dress and will continue to do so. Isn’t it incredible how much clothes can remind us of certain times in our lives. In this case, not the best times as my life wasn’t easy five years ago. However, the way clothes bring back such vivid memories is quite remarkable. My shoes are a much more recent purchase. I’ve been cutting down the spending this year. However, these shoes are one of the few items I’ve purchased. I’ve mentioned a few times how I’m a major fan of B.A.I.T Footwear. The vintage designs are unrivaled by other brands and they are very comfortable. I’ve built up quite a collection now (hoping to do an post on my updated collection soon). I have the Robbies in a few different colours now and when they were released in red I simply couldn’t resist. I’ve noticed Kitten D’Amour appear to have replicated a few B.A.I.T Footwear designs now including the Robbies. I’m not sure the background on it but from my perspective I’m not a fan of the replication. Now I have the red version of the Robbies from B.A.I.T Footwear I appreciate how much better they are; a much classier deeper shade of red, patent and overall better quality. Thanks so much for your advice regarding my photos being stolen on ebay. It was very helpful and I really appreciate it! 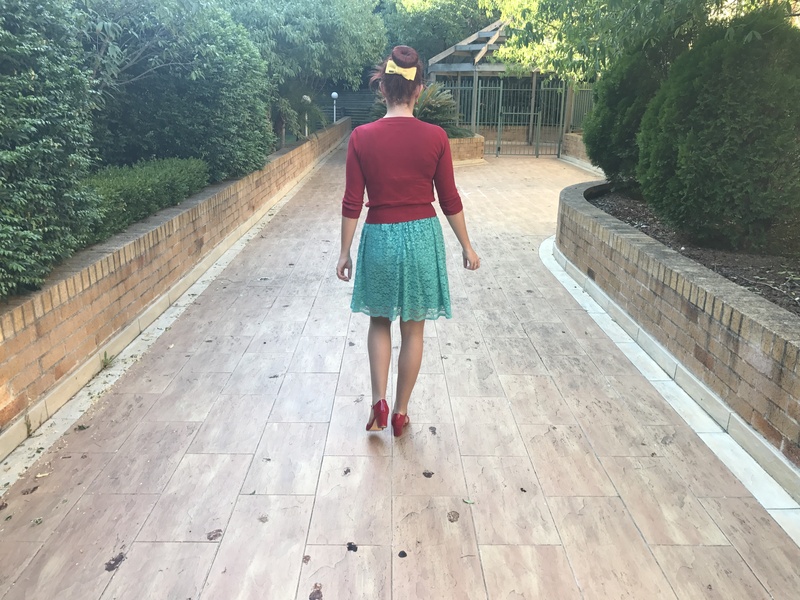 This entry was posted in Alannah Hill, BAIT Footwear, Outfits, Portmans. Bookmark the permalink. PS Love the Robbies! Good to know they're comfortable too! This outfit is so sweet… but i'm crazy in love with the shoes!! This is a lovely combination so I can see why you love them together. And your new shoes are totally darling! Such a cute dress. loved the pop of red! I like when unplanned outfits turnout to be ones you really enjoy, it's a nice benefit on a day you're already running behind! I know what you mean about associating memories and emotions with clothes. Part of the reason why I have such a hard time letting any go! You can never go wrong with red and green, such a beautiful combination. You look stunning! They're such eyecatching colours! I love the floral detail on the dress. My favorite colors too, great combination dear! A lovely look! The dress is fab! Beautiful outfit! Wonderful color combination! 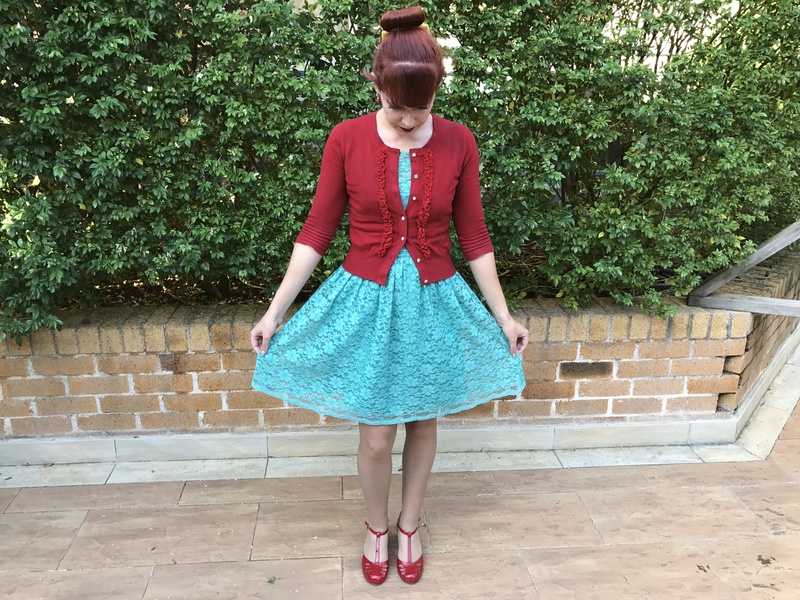 Such a lovely dress and cardigan! Cute look! 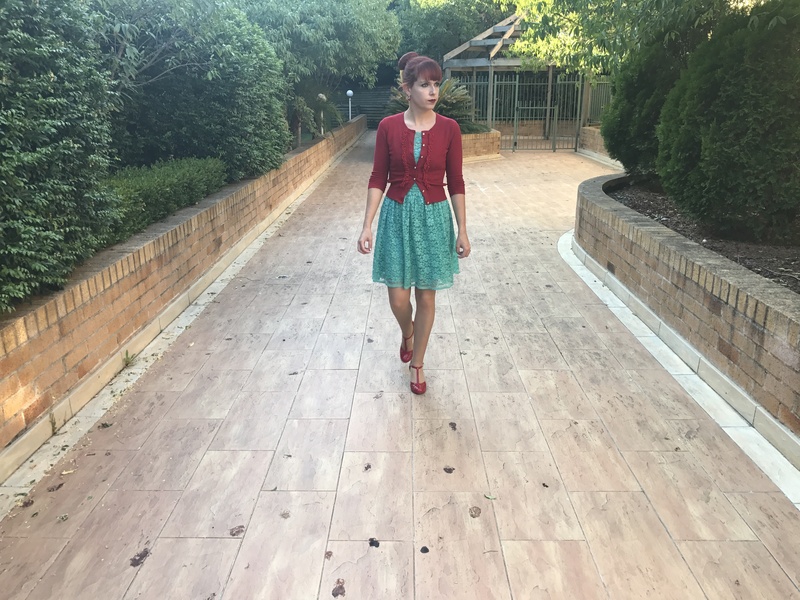 I like red and green outfits and you do it so well, I love your dress and cardigan! And above all, I loved the new purchase, the shoes are really amazing, and the whole combination seems so feminine, like you always are! I am eeeeager to buy shoes like those believe me! And red is my favourite colour! Hope you have a very lovely day, dear Imogen! This outfit is so feminine and pretty and, body con in the most subtle way. 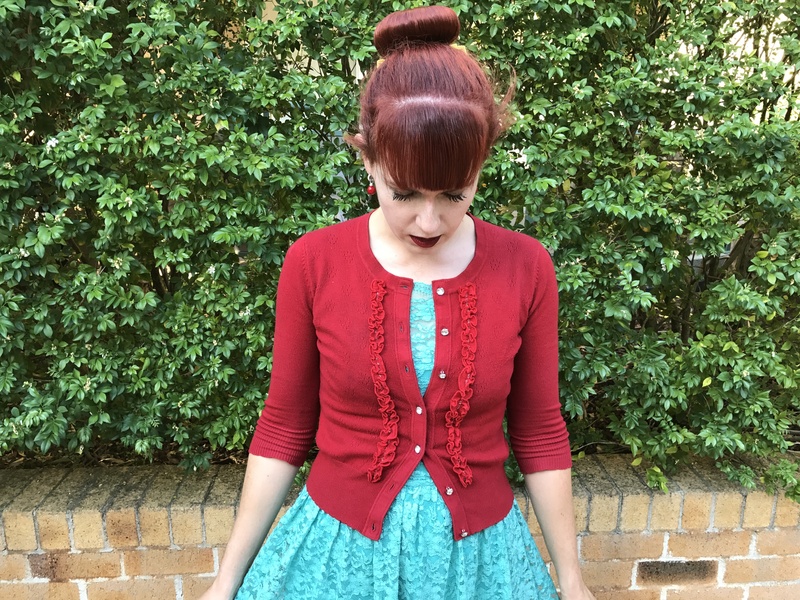 Love the color combo, the great MaryJanes, and your hair up! What a lovely dress, Imogen. I have seen these two colors around at Valentine’s Day, and I’m really starting to like them. : ) Love those red shoes. You look so cute. That Portmans Lace Dress is gorgeous! 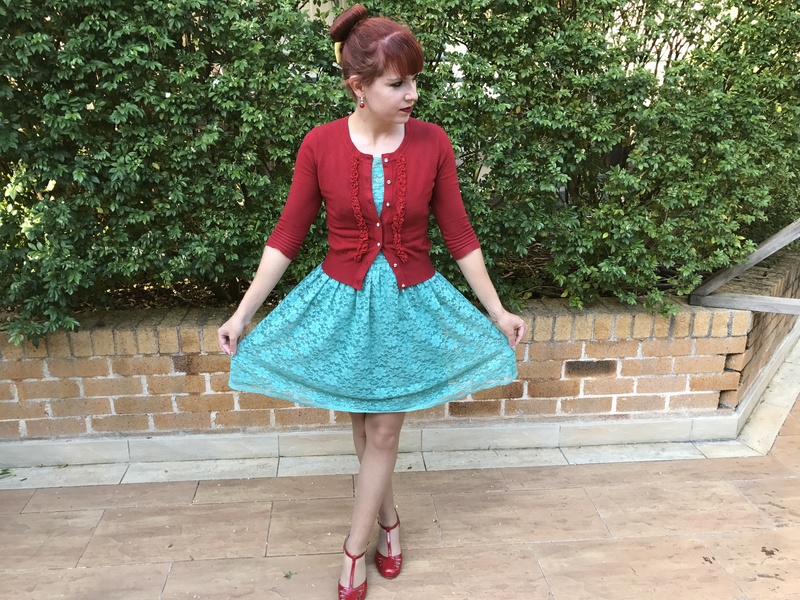 I love the lace, the pleated appearance, its mint green colour and its complementary contrast with your frill trimmed rich dark red Alannah Hill ‘You Gossip’ Cardigan. It’s a wonderfully feminine and pretty outfit. I love it!